Rough and Tumble Historical Association, Inc. is a unique 501(c)(3) non-profit museum located on 33 acres in Lancaster County in PA that helps preserve America's Agricultural and Industrial history by holding events throughout the year. We have many operating exhibits as well as numerous Steam Traction Engines including the 2nd Oldest running Steam Traction Engine in the US, the Schiedler built in 1886 recently restored! See the video of the first test of this engine in our 2012 Photo Gallery. Ride two special Steam Trains that loop around our grounds. 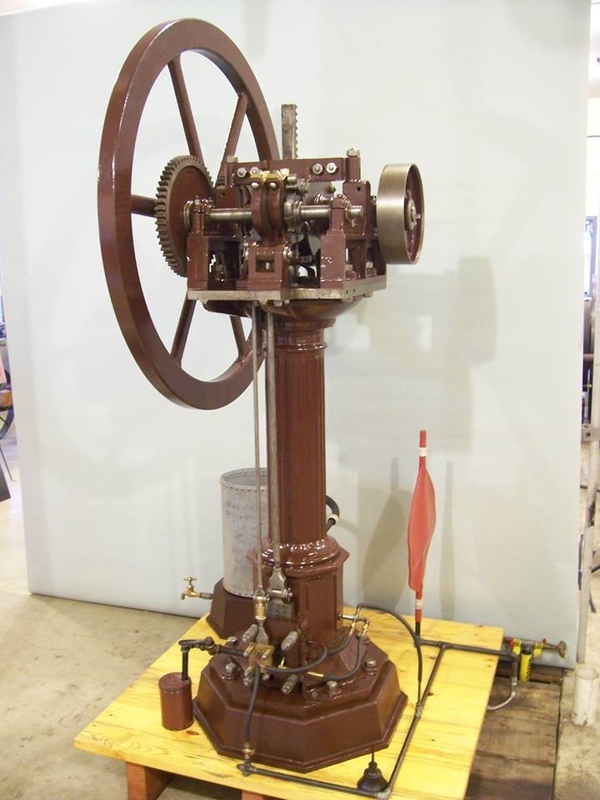 There is a huge collection of Gas Engines including the Oldest Internal Combustion engine running in North America built by Otto and Langen in 1867 and the oldest running Diesel Engine built by M.A.N. We have a large building of Stationary Steam Engines all running. You will see some of the best restored John Deere, IH, and Rumely tractors around to name a few. Our Model Shops have many very unique hand built items on display and running. Watch our Blacksmiths forging items. Founded in 1948, we are celebrating our 71th year in 2019 with the unique history as one of the longest and earliest running organizations of this type in the U.S. Rough and Tumble is "The Most Complete Operating Steam and Gas Engine Show in the East"! Our Threshermen’s Reunion attracted thousands of visitors from across the U.S breaking attendance records last year. Come visit us and see up close the wide range of unique operating equipment of all types on our grounds. The 71st R & T Threshermen's Reunion is the 2nd Oldest show in the Country to be held again August 14th to the 17th in 2019 featuring Minneapolis Moline and Water Pumping Equipment. The 20th Annual Empire Expo will be held by The Empire Tractor Owners Club in conjunction with the 71st Annual Threshermen’s Reunion. • Rough and Tumble Engineers Historical Association Reserves the Right to Refuse Admittance to Anyone at Anytime for Any Reason. (This includes Members). Admission Guidelines can be found here. Welcome to the New updated, mobile friendly Rough and Tumble Web Site. Our site allows members and visitors to join, renew, and update their Membership and purchase Membership and Gift Shop items on line with their credit card via PayPal. Members can also sign-in and update their profile information, read R & T By-Laws, Club Info, and download and print the quarterly Whistle newsletter. The unique Otto & Langen engine at Rough and Tumble turned 150 years old this month, Happy Birthday! The specs of the engine are 5.9" bore, 37" maximum stroke, 49" flywheel, 1/2 HP at 80 Rpm. It is the oldest internal combustion engine on this continent. Out of the 4 remaining fluted column engines in existence, it is the most original. 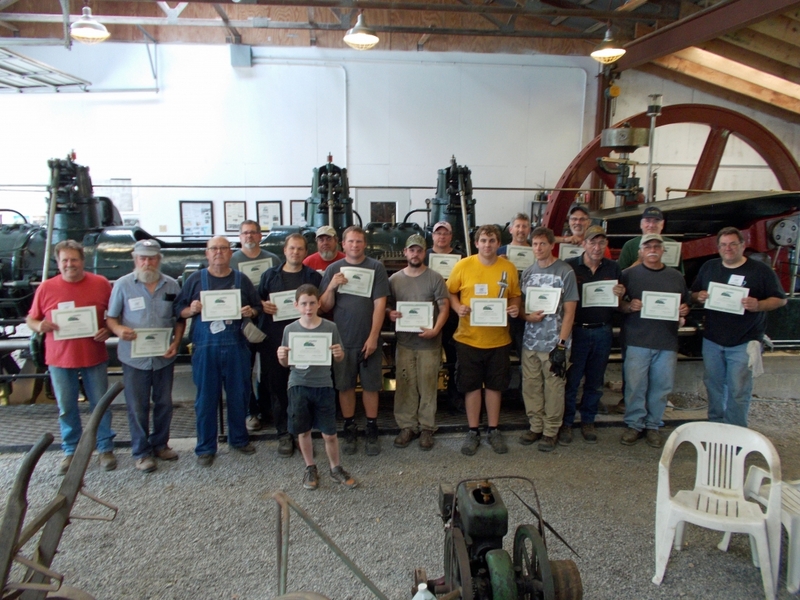 The letters have been mailed to the students for Gas Engine School 2019. If you do not receive your letter(s) by Saturday, March 23, 2019 please email Kathleen at [email protected] If anyone is still interested in attending the class, we still have a few openings, please email Kathleen to register. The years first event, the Antique and Classic Tractor Pull will be held April at Rough and Tumble. Come out to the pulling track and watch antique and classic gas tractors complete pulling down the track. Gates Open 8:00 AM. Tractor weigh-in starts at 8-10 am. Tractor Pull starts at 10 am. There will be a food truck at the track. More information is available here. Admission Free!! Come and Join in the Fun of the Opening of our Show Season. The highlights, Always a Crowd Pleaser, is Plowing with both Steam and Gas Tractors (plowing to be held only if weather is favorable to plow). On Display and in Operation will be Steam and Gas Engines, Steam and Gas Tractors, Antique Cars, Model Shop, Sawmill, Two Steam Trains, Blacksmith Shop plus more! The program is available here. Spring Steam-Up is a special event. It's time to get the steam engines out of hibernation and fire them up. Better yet, it is plowing season, and again weather permitting, both steam and gas powered tractors may be seen plowing in the fields adjacent to the R & T grounds. Along with the gas and steam powered tractor pulls, there were many opportunities to see these engines working under a load! There will be a tractor pull Friday evening with weigh in at 4-6 pm. and pulling starting at 6 pm. More info is found here. Members are always invited to attend the monthly Board meetings and becoming involved. Looking ahead, R & T will need several new Directors and a new President for 2020. Come and attend some meetings and hear what it takes to run Rough and Tumble as the unique organization it is. If you have an interest in being involved on the Board, please speak with anyone on the Nominating Committee or attend a board meeting. I have just been given photos and restored them from the 1978 Threshermen’s Reunion show found in the attic of a home purchased by Jeff and Deb Sweinhardt. You can see the photos here. The 2018 Tractor Pulling Results from the October Time of Harvest show are available here. Tractor Pulling information is available here including Tractor Pulling Regulations. Would you like to join or renew your Rough and Tumble membership? Click here for a printable Membership Application to mail, or Click here to Join or Renew your Membership on-line via PayPal with your credit card after loging in under Profile. Membership in Rough and Tumble is widespread both by age and geographically. It is not unusual to see three and even four generations of a family riding around the grounds on a huge steam traction engine during events. Likewise, the parking lot is full of cars and motor homes from all over the United States and Canada during Annual Reunions. Membership in Rough and Tumble renewable at the beginning of each year and is payable at the gift shop, via mail or now by PayPal with your credit card thru our web site. We also offer Lifetime memberships. Membership brings many benefits. The 2019 R&T Brochure is now available here. We will be featuring Minneapolis Moline and Water Pumping Equipment. 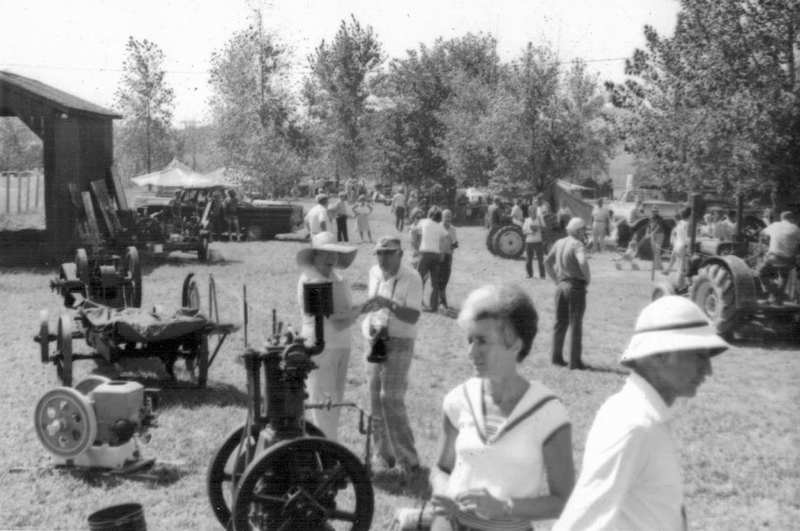 The 20th Annual Empire Expo will be held by The Empire Tractor Owners Club in conjunction with the 71st Annual Threshermen’s Reunion with more info available here. The show will be held August 14-17, 2019. The R&T 2019 Poster is also available here. Please note if you renew your membership online via paypal before you receive your mailed membership card just prior to a show, you should bring your PayPal receipt for entrance. The 71st Annual Threshermen's Reunion will be held featuring Minneapolis Moline and Water Pumping Equipment including the 20th Annual Empire Expo August 14-17, 2019. Exhibits included Steam Traction Engines, Antique Tractors, Threshing Machines, Hit & Miss Gas Engines and Large Gas Engines. Ride Two Steam Trains that loop our grounds, Visitors watch the Saw Mill and Shingle Mill in Operation. Visit the Model Shop , Antique Car Museum, and the Large Stationary Steam Engine Museum. See the featured Rumely Display, Stationary Balers, Antique Wagons and the new Line Shaft Machine Shop. There are many activities for Children including the Children’s Pedal Pull. Blacksmiths pound Iron, the Huge Flea Market 2-3 acres will have over 100 vendors. There are the large John Deere and IHC Displays, Numerous Craft Displays. Antique Earth Moving Equipment in Action. The Daily Parade of Power and the Pageant of Threshing. Enjoy the Good Home Made Food with Plenty of Shade around the grounds. 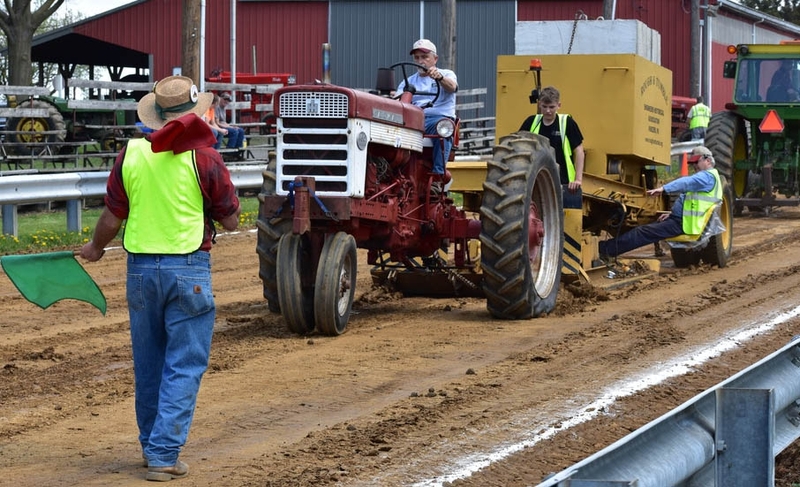 Evening activities includ Tractor Pulls, Steam Games, and Antique Tractor Pulls. Photos and videos from the Reunion are available to look at here. We Demonstrate the Daily Pageant of Threshing!! From Hand, to Horse Power, to Steam, to Tractors at the Threshermen’s Reunion! All of us at R&T would like to thank all the Members, Volunteers, and Visitors that came to Rough and Tumble last year. It was a safe year with continued growth in the organization with big plans for our 2019 shows this year. Rough and Tumble will hold our third Gas Engine School offered anywhere in the US for the operation, safety, and care of gas engines this year. Students operate and learn about engines from our unique oldest gas engine in the US, the Otto and Langen built in 1867 to our large 485 hp Cooper engine. Students run the O&L, Cooper, Twin Miller, 3 ball Klein, 15 HP Reid and some small engines as well. There is so much to learn between anything from ignition to timing of these industrial beautiful engines of the age. The Volunteers that take care of these engines are several of the most knowledgeable people in the use of these engines. More info is available here. Photos are available here. 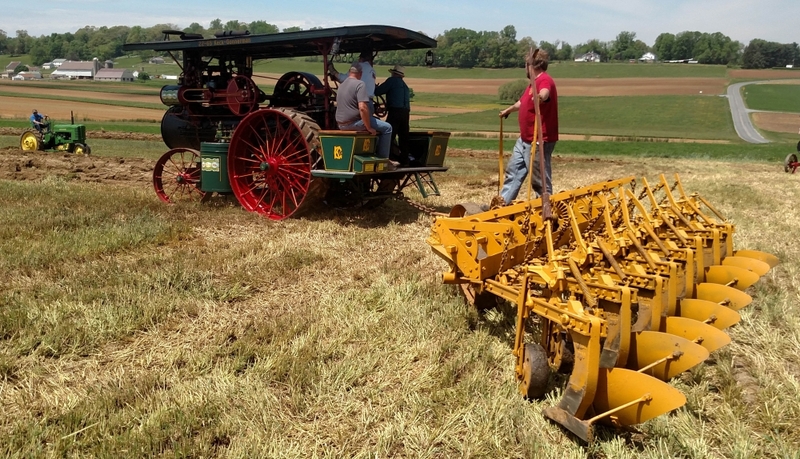 The Rough and Tumble Pulling Committee is pleased to announce that we are including Classic Tractors to our pulls along with the Antique Tractors. A new web page has been added for Tractor Pulling Information under R&T Information and can also be accessed here which included links to regulations. The Gift Shop has been remodeled and there are new items online. You will see a beautiful redesigned and updated shop. Wayne Hartshorne headed up the project and his team did a fantastic job. There is new flooring, fresh paint, new shelving, and the counters were moved to improve access. The new windows and air conditioning have been installed also. It is the time of year around Rough and Tumble to prepare for 2019 activities. Volunteers are working on projects around the grounds preparing for events. Jim Wiest is the Volunteer Coordinator and is working on a variety of projects around the grounds. Every weekends Saturday Volunteer Activities can be seen on the Volunteer section in Saturday Volunteer Activities here. A special thanks for all the Volunteers that help make Rough and Tumble the great and unique organization it is today! We have several projects going on this year and more information can be found on our Volunteer Info page above. Another Volunteer with projects around the grounds to connect with is Wayne Hartshorne who is working in various areas. Rough and Tumble has received some great reviews on TripAdvisor. We thank all the many people that visit our unique Museum every year. The link to TripAdvisor with our reviews can be found here. The Patriot News of Central PA wrote a special article on what Rough and Tumble has to offer a visit to our grounds during shows. You can read their article "Rough and Tumble's show of power is like no other ", here. Our Circa 1900's,Line Shaft "Machine Works" continues to grow and add more equipment. We would like to thank R & T Director Bud Burdy and his team for the beautiful job they are doing after much research on how to design and build the shop. You can see project photos in the Photo Albums. They are finding more interesting circa equipment as the project progresses. Notethe ceiling mounted line shafting. Bill Hazzard and his team have worked the Cooper Engine Project for many years from dismantling it in Ohio, to bringing it back to R & T, pouring concrete and installing the engine. Bill was able to turn over the engine with compressed air in the summer of 2012 to prove the mechanics. The next step was to complete the exhaust, fuel supply lines, and cooling system which is now complete. The engine first ran for 30 minutes on 7/20/13 as shown on the video. Look at the Cooper Engine Project and New Running Videos in our photo section. New Notes and an engine diagram were added to photos pages. A Great Piece of Cooper History from Roger Kriebel has been added regarding the Cooper Engine. You can see that information here. IHC Spring Show and R & T Tractor Pull June 21st & 22nd.